plants make their own food using energy from the sun. plants convert sunlight into energy. 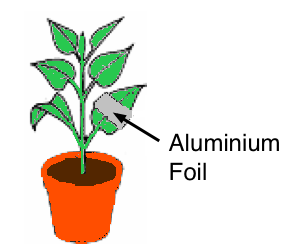 food and minerals travel in a plant. plants grow towards the sunlight. Where in the plant does photosynthesis take place? In cells of the roots. In addition to light energy from the sun, what two substances are needed in order for photosynthesis to take place? Apart from glucose, what other substance is produced during photosynthesis? Which one of the following statements about photosynthesis is incorrect? Carbon dioxide travels up from the soil through the roots of the plants. Chlorophyll must be present in the leaves. Sunlight is necessary for photosynthesis to occur. Water travels up from the soil through the roots. Photosynthesis is important because without it we would not exist. Photosynthesis reduces the amount of carbon dioxide in the atmosphere. We get a tan from photosynthesis. Chlorophyll is produced during photosynthesis. Which one of the following word equations best describes the process of photosynthesis? In an experiment a student has to de-starch the leaves of a plant. How is this done? By placing the plant in darkness for more than 48 hours. By placing the plant in direct sunlight for more than six hours. By placing the leaves in boiling water for about two minutes. By placing the leaves in warm alcohol for about ten minutes. 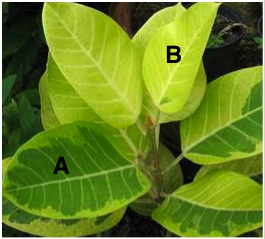 Which one of the following is used to test for the presence of starch in a leaf? During photosynthesis, how does carbon dioxide get into the plant? Through stomata on the stem and leaves. Through stomata located on the flower. Through the edges of the leaves. The diagram shows a variegated leaf. A test for starch was done on the leaf. Where will the starch be found? Tests are done on four leaves similar to those shown. Which leaf will give a negative result? (no starch found)? 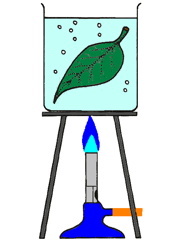 In an experiment to test a green leaf for starch, the leaf is initially placed in boiling water. What is the purpose of this? To kill the cells in the leaf. To remove chlorophyll from the leaf. To kill any bacteria on the surface of the leaf. This test only works at a high temperature. During an experiment to test a green leaf for starch, at one stage the leaf is soaked in warm alcohol for about 10 minutes. To kill any bacteria on the leaf. This test only works when alcohol is present. 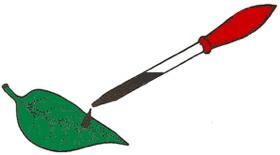 During an experiment to test a green leaf for starch, iodine solution is placed on the leaf with a dropper. If starch is present in the leaf, what colour change takes place? There is no change in colour. In which one of the following plants does photosynthesis NOT take place? Pondweed is a green plant that lives in water. 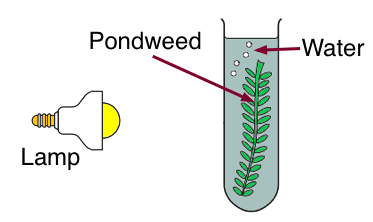 In the presence of light pondweed undergoes photosynthesis and a gas is produced as one of the products. What is the gas produced? Pondweed is a green plant that lives in water. In the presence of light pondweed undergoes photosynthesis. 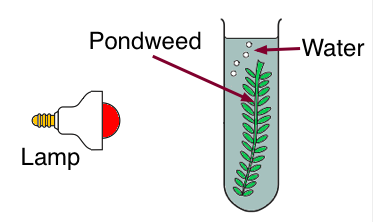 The pondweed, and all green plants, take in and use a gas, from their environment during photosynthesis. 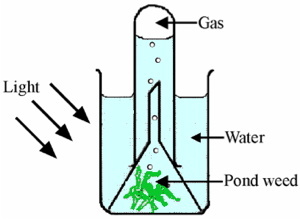 In the experiment shown, bubbles of gas are seen to be formed when pondweed photosynthesises. How may the rate of photosynthesis be increased? By increasing the amount of light. By adding acid to the water. The plant shown in the diagram was left in total darkness overnight and then exposed to strong sunlight for four hours. The leaf with the foil was foil removed from the plant and tested for starch with iodine solution. Which one of the following is most likely to happen? The uncovered part of the leaf goes blue/black. The covered part of the leaf goes blue/black. All of the leaf goes blue/black. None of the leaf goes blue/black. In this equation, what are X and Y? Farmers do not put their cows out in the field during winter because there is less grass growth. There is less sunshine in the winter. There is too much rain in the winter. The temperature is too low in the winter. The ground is too soft in the winter. A group of pupils investigated the way in which the colour of light affects photosynthesis. counted the bubbles of gas produced by the pondweed every minute for three minutes. The pupils repeated their experiment using a blue light bulb, a green light bulb and a yellow light bulb. What was the independent variable in the investigation? The colour of the light bulbs. The number of bubbles produced every minute. The distance from the bulb to the pondweed. A control is used in order to make the investigation fair. Which one of the following could not be considered a control? Repeat the experiment at the same time each day for four days. Don't change the distance from the bulb to the test tube. Use similar lamps with the same power output (Watts). Use the same pondweed for each bulb. 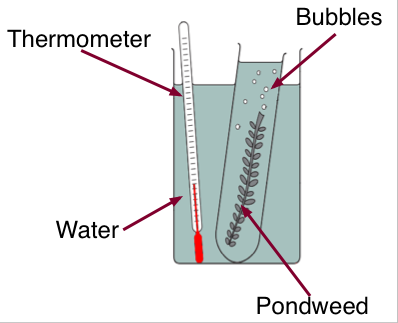 A student investigated the effect of temperature on the rate of photosynthesis in pondweed. The diagram shows the way the experiment was set up. What two measurements would the student make to calculate the rate of photosynthesis? Temperature of the water and the number of bubbles. Temperature of the water and the number of leaves on the pondweed. Volume of water and the number of bubbles. Volume of water and the temperature of the water. What is the function of photosynthetic tissue in plants? 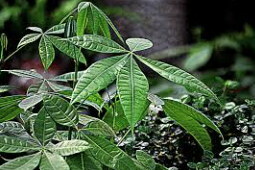 Makes sugar by photosynthesis to feed the plant. Transports food around the plant. Transports water and minerals around the plant. To convert stored food into energy needed for growth. Which one of the following statements concerning a green plant left outdoors is true? It respires by night only. It photosynthesises by night and respires by day. What colour is usually associated with chlorophyll?